The Accounts Receivable template for Excel (Accounts Receivable Manager) provides an input area for entering or linking data for records of customer names, outstanding amounts and due dates for payments. The accounts receivable template then automatically updates a detailed report with charting for analyzing business cash flows and accounts receivable. The accounts receivable and cash flow reporting updates automatically to underlying data. 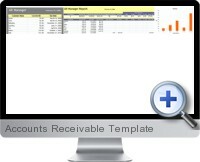 The structure of the template allows to quickly and easily organize and analyze accounts receivable. Reporting is professional designed to gain fast insights into business cash flow and print in high quality format for publishing. Two versions are included: one for Excel 2007 and higher (XLSX) and one for Excel 2003 and lower (XLS).